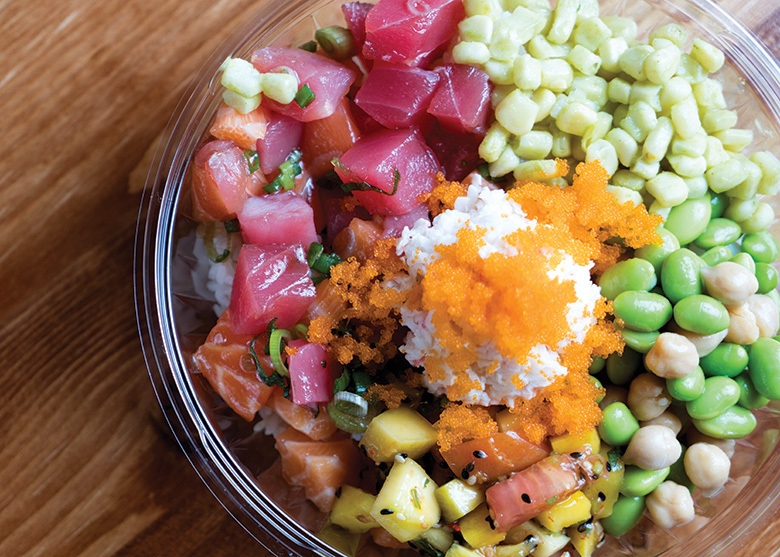 Poke is everywhere—here’s where to dive in. Who could have predicted how ridiculously fast poke would take over our dining scene in the past year? Even casual sports bars are getting in on the fish-bowl action. The savory salad-like seafood preparation is a traditional Hawaiian dish. At its simplest, it’s little more than cubes of raw tuna marinated in soy sauce and sesame oil. But that basic recipe leaves plenty of room for improvisation. The new crop of fast casual poke shops—launched by Sam Choy (via both food truck and brick-and-mortar storefront including a new Tacoma location) and popularized by the cult hit 45th Stop N Shop & Poke Bar in Wallingford—are serving an assortment of raw seafood, and even tofu and cooked beef, plus ingredients to mix in that range from the traditional (seaweed) to the unconventional (orange slices). It’s healthy (mostly), quick and easy to eat at your desk; here are just a few of our favorite poke purveyors. Belltown’s newest poke bar (the FOB stands for “fresh off the boat”) doubles as a salad bar—another hot trend still raging from last year. Still, the star of this dish is always the fish. At this simple walk-in shop, that means not only salmon and tuna, but yellowtail, cooked shrimp and even sous vide beef tataki. Our pick: It’s entirely “build your own” here (small $9.99, large $12.99): Try the FOB rice (infused with coconut and green tea) or go with the salad mixed with dressing, such as a roasted sesame, before heaping on the protein. That beef, though unconventional, is actually tasty. A small national franchise with half a dozen locations and more in the works (including in Bellevue), this simple downtown poke shop is mighty quick, even during the lunchtime rush, when the line snakes through the dining room. Order in the same way you would at Chipotle or Evergreens. Our pick: The spicy ahi bowl ($10.50) is a great place to start, but Pokéworks excels in customizations (most at no extra charge): add seaweed salad and something crunchy, like toasted macadamia nuts or wonton crisps, plus avocado (an extra $1.50) for the greatest bowl. With a name like Steven Ono—a Hawaiian word meaning delicious—the owner (and Hawaiian native) of this new Edmonds poke shop was destined for success. His poke includes more of the grisly, chewy bits from the fresh fish, which he says is a nod to its traditional preparation. Our pick: The ahi limu (ahi means tuna; limu is the general Hawaiian word for algae or seaweed) is authentic and flavorful—the sort of thing Ono craved after moving to the mainland (bowls $9–$15). Enthusiastic staff will offer a taste before you decide on your order at this welcome addition, decorated in green and white, to the Chinatown/International District. The casual restaurant, owned by the Le siblings, serves poke standards—big, colorful bowls plus a seemingly endless array of add-ons—and other Hawaiian favorites, like Dole Whip (pineapple soft serve), Spam musubi and Bubbies’ mochi ice cream. Our pick: The combo poke bowls ($15) are best for beginners, as they have a little bit of everything. The signature GoPoké bowl has a trio of proteins dressed in the simplest traditional sauce—the tako (thin, tender disks of octopus) is particularly enjoyable. The heart-eyed fishy decals that appear to be swimming across this Capitol Hill eatery’s back wall dodged the fate that awaits their real flesh-and-fin kin: slicing and dicing and marinating and munching. But at least Wanderfish focuses on sustainable fish in its creatively composed bowls. Our pick: Between the rice and the raw fish, poke can occasionally get lost in a sea of one-note texture—not so with the crisp garlic, onion and furikake (a flavorful Japanese mix meant to be eaten sprinkled over rice) of the Crunch Bowl ($9.49 small, $12.49 large). Get it with the wild sockeye salmon, atop kelp noodles, seaweed and white rice tinged green by a soak in bamboo.